CARACAS - Venezuela has stopped publishing official data on its rate of inflation, but one expert on monetary policy says the current rate is 615 percent. However, Professor Hanke believes the officially published rates have always underestimated the actual rate of inflation in Venezuela. He bases his estimates on the black market exchange rate where the bolivar has been sinking like a stone versus the dollar. Dolar Today, a website which tracks the exchange rate, says it takes 611 bolivars to equal one U.S. dollar; that’s up sharply from just a month ago. The real world result of Venezuelan hyperinflation was highlighted by the BBC’s Daniel Pardo in a video report published Tuesday. Pardo tallied the cost of ingredients for a simple Venezuelan sandwich called an Arepa. Two weeks later, Pardo bought the same ingredients and found the price had doubled. For over a year, there have been reports on shortages of basic staples in Venezuela, forcing people to line up for hours to find items like bread, milk, soap, and toilet paper. When video of the lines began to circulate, the government made it illegal to line up outside, forcing the lines out of sight. The popularity of Venezuela’s socialist government has declined sharply since the death of Hugo Chavez. 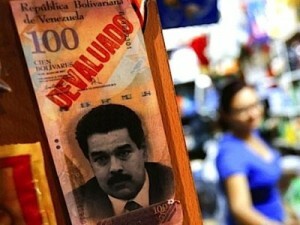 His successor Nicolás Maduro’s approval ratings were hovering around 25 percent earlier this year. Those figures might be worse if not for the government’s near complete control of the media in Venezuela and its propensity to jail opponents. Opposition leader Leopoldo López has been in a military prison on trumped-up charges since last February. Recently, he went on a month-long hunger strike to demand the government set a timetable for elections.López ended his strike last month, one day after elections were scheduled for December.